Albert Pujols: A Puzzle for the Next Manager? 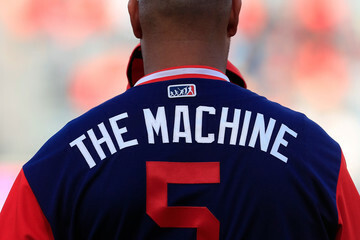 His nickname is The Machine, earned during those prolific seasons in St. Louis, and Albert Pujols embraces it, wearing it on the back of his Angels uniform last weekend. At some point in his mid-40s Pujols will receive first ballot election to the Hall of Fame, without doubt, without question, but The Machine’s route has become rutted by injuries. In seven seasons with the Angels he has missed 147 games (certainly not all because of injuries) compared to 76 games in 11 seasons with the Cardinals. On Wednesday, at 38, he had arthroscopic surgery on his left knee for the second time in six years. He also missed the last two months of the 2013 season because of plantar fasciitis in his left foot, a condition that impacted his right foot in both 2015 and 2016. As Pujols has continued to knock off one historic milestone after another, the injuries, the toll of age, has cut into his overall production. He ends this season with a .245 batting average, 19 home runs and a .289 on-base percentage. In several categories of advanced metrics during the last two seasons in particular he has performed below the league averages. Pujols has three years and $87 million remaining on his playing contract with the Angels before embarking on a 10 year, $10 million personal services contract. There is no reason to believe that owner Arte Moreno is giving consideration to sitting down with Pujols and discussing the possibility of beginning that personal services contract earlier, freeing up some of the $87 million for use on other available players. Nor is it my suggestion that Moreno should do that. No player carries himself with more pride or is more respected in the clubhouse, where Pujols has been a private sounding board for Mike Trout. Nor has any player been more active in the community. However, there is no question that the Pujols situation has become a payroll and roster balancing act for general manager Billy Eppler and will remain a first base/DH balancing act for the new manager, the lineup situation complicated by Shohei Ohtani’s DH availability. Next year, for the first time since 2010 and the first time since Pujols acquisition, the Angels will play a June series in St. Louis. It is certainly safe to say that Pujols will want to return as an active player in more ways than one. It’s just that predictions involving The Machine have become increasingly difficult. The Dodgers current series with the Arizona Diamondbacks will be followed by three games with the New York Mets, whom a Los Angeles columnist, building a case for the Dodgers’ allegedly softer schedule over the final month, described on Friday as dreadful. I suppose that’s apropos given the Mets’ 59-74 record but then the Mets don’t seem quite so dreadful when Jacob DeGrom (1.68 earned-run average), Noah Syndegaard (3.51) and Zach Wheeler (3.46) are on the mound and facing down a cast of uppercut swingers. Youth Being Served has never been more prevalent than in the current battle for the rookie of the year award in each league. The National League is a contest between Roland Acuna Jr. 20, of the Braves and Juan Soto, 19, of the Nationals. The American comes down to the Yankee tandem of Miguel Andujar, 23, and Gleyber Torres, 21, and the Angels’ Ohtani, 24, who has done things this year that haven’t been done for 100 years and whose candidacy may hinge on how he performs on the mound over the final month, returning from his elbow injury on Sunday to face the Astros. The Yankees acquisition of Andrew McCutcheon speaks to GM Brian Cashman’s executive of the year credentials and his ongoing concern about Aaron Judge, who broke a wrist bone when hit by a pitch on July 26 and remains unable to swing a bat. Brian Kenny, the MLB Networks’ analytics honk, calls the Triple Crown an antique because batting average, RBI and home runs no longer carry the weight they once did in the new metrics world. Call me an antique but I say that if J.D. Martinez wins the Triple Crown–he currently leads in RBI, is tied with Khris Davis for the home run lead and is a close second to Boston teammate Mookie Betts in batting–he deserves to be on the same pedestal as the previous 15 Triple Crown winners and would also be a deserving MVP. .
Winning the triple crown is an awesome achievement. How did Ted Williams not get the MVP the two times he won the triple crown in unfathomable.